Yesterday we wrote to you about the victory in our fight to stop the deportation of people seeking asylum in Israel. But within hours of the announcement of the deal to prevent these refugees from being sent to Rwanda or being jailed indefinitely, Prime Minister Netanyahu suspended the plan, caving to right-wing pushback. So we've got to keep up the pressure. 1. Grab a piece of maror (horseradish root, romaine lettuce, or endive) and an envelope. Write #NoMoreMaror on the envelope. 2. Download and print this page. Add your own note if you'd like, and put the page and the maror into the envelope. 3. Take a selfie with your package and post the photo on Facebook, Twitter, and/or Instagram. 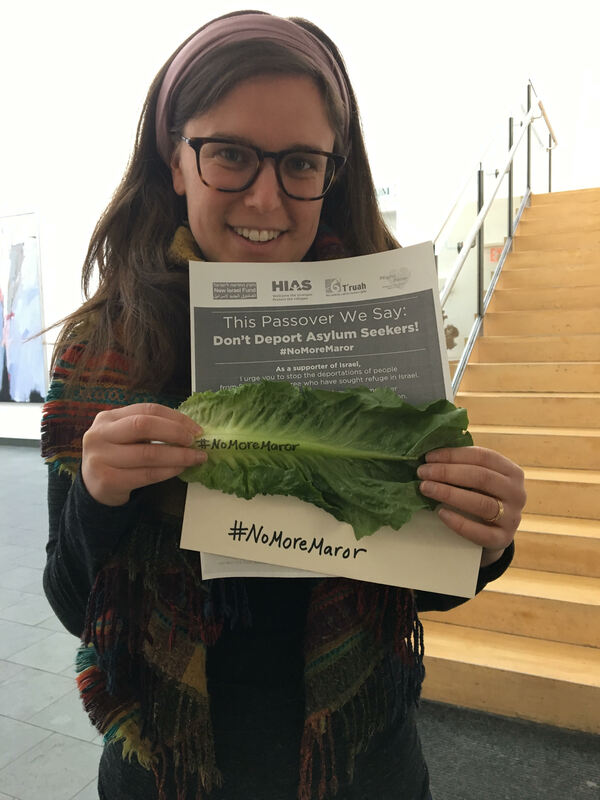 Remember to include #NoMoreMaror and to tag @IsraelinUSA @TruahRabbis @NewIsraelFund and @HIASRefugees. Embassy of Israel, 3514 International Drive N.W. Washington D.C. 20008. Join us in continuing the fight for liberation, and thank you for wiping out bitterness, and making life sweeter in Israel and beyond.